Dazzling with its polychrome radiance, an eight-pointed star glitters on this decorative plate. The magical motifs recreate the legendary ceramic work of the Inca civilization. 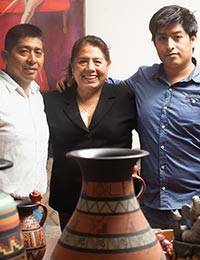 The Huaman Paucar Family meticulously crafts each piece, capturing the style and spirit of ancient peoples. Because each plate is individually crafted, there may be slight variations in color and form. 2.5 cm H x 20 cm Diam.